With experience and education, greenskeepers can work up the career ladder. There are many greens team positions to grow into, such as equipment manager, spray technician, irrigation technician, foreman, assistant superintendent, superintendent. Interns and entry level groundscrew can expect to earn anywhere between minimum wage and upwards to $20 an hour. According to the 2017 Compensation and Benefits report by the Golf Course Superintendents Association of America (GCSAA), golf course superintendents make an average of $89,189 annually, whereas the average base salary for an assistant superintendent is $43,108. Equipment managers report earning an average of $47,244 a year. Education plays a substantial role in expected superintendent salaries. 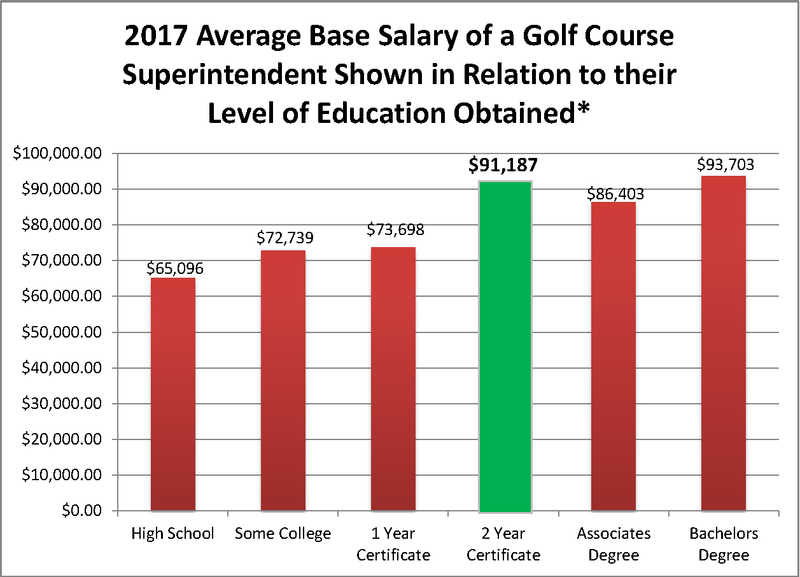 The chart below shows the average annual base salaries of golf course superintendents based on their level of education. You'll see that the average base salary for 2-year certificate holders is close to the average base salary for those who have earned 4-year degrees. In short, golf course superintendents with a 2-Year Certificate are among the top earners nationwide. Golf course superintendent salaries also vary widely by state. According to the GCSAA 2017 Compensation and Benefits report, the mean salary for New Jersey golf course superintendents is $112,514. In Pennsylvania the average golf course superintendent salary is $93,222 and in South Dakota it is $66,715. In addition to individual education and course location, the type of facility plays a role in how much staff members earn. A turf manager's salary depends on whether you work on a private, public or municipal golf course. Private courses typically offer the highest salaries. As is often said, there is no substitute for hard work. Years of experience, years of loyalty to a particular golf course, management skills, talent for motivating crews and countless other factors affect the salary a golf course turf manager or superintendent may earn. You can make a healthy and honest living as a turf manager and we offer the education you need to succeed in the greens industry. Rutgers Professional Golf Turf Management School is designed to help up-and-coming turf managers, like you, do your job better, so you can advance your career and grow your salary. We teach our students to work smarter, not harder. Our curriculum is focused on the math (calculating area, fractions for pesticide calibration, etc.) and science (insect life cycles, PH levels of soil, etc.) behind turfgrass management. In addition, our expert instructors cover budgeting and management techniques, the very skills which often differentiates superintendents from assistants.